Would you make a good construction worker? Take our career test to find out how you match with this and over 800 other careers. What is the workplace of a Construction Worker like? A construction worker is someone who does many basic tasks that require physical labour on construction sites. Construction workers work on all construction sites, doing a wide range of tasks from the very easy to the extremely difficult and hazardous. Although many of the tasks they do require some training and experience, most jobs usually require little skill and can be learned quickly. Construction workers do a variety of construction-related activities during all phases of construction. Although most are generalists—such as those who install barricades, cones, and markers to control traffic patterns—many others specialize. For example, those who operate the machines and equipment that lay concrete or asphalt on roads are more likely to specialize in those areas. Construction workers use a variety of tools and equipment. Some tools are simple, such as brooms and shovels; other equipment is more sophisticated, such as pavement breakers, jackhammers, earth tampers, and surveying equipment. With special training, workers may help transport and use explosives or run hydraulic boring machines to dig out tunnels. They may learn to use laser beam equipment to place pipes and use computers to control robotic pipe cutters. They may become certified to remove asbestos, lead, or chemicals. Are you suited to be a construction worker? Construction workers have distinct personalities. They tend to be realistic individuals, which means they’re independent, stable, persistent, genuine, practical, and thrifty. They like tasks that are tactile, physical, athletic, or mechanical. Some of them are also enterprising, meaning they’re adventurous, ambitious, assertive, extroverted, energetic, enthusiastic, confident, and optimistic. Does this sound like you? 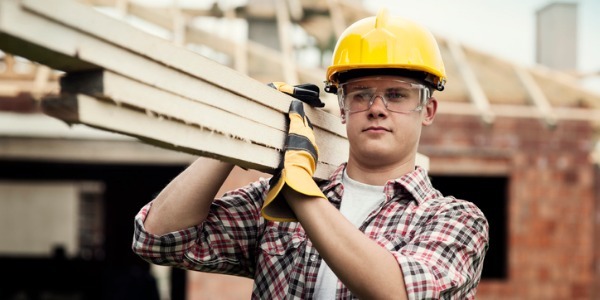 Take our free career test to find out if becoming a construction worker is right for you. Construction workers held about 1 million jobs in 2010, of which 59% were employed in the construction industry. About 23% of construction workers were self-employed. Most do physically demanding work. Some work at great heights or outdoors in all weather conditions. Some may be required to work in tunnels. They must use earplugs around loud equipment and wear gloves, safety glasses, and other protective gear.